Showing 1 - 2 of 2 Products for Cable Make Up Kit. 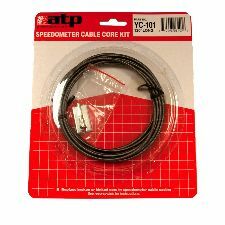 ATP Speedometer Cable Core Kit provides a lower cost alternative to cable repair when the cable core has broken or kinked. Each kit includes 0.130" diameter S.A.E./O.E.M. standard multi-coiled wire cable with squared end, universal metal tip and spacer washer. Cut cable end to desired length and attach tip using staking tool (included). The overall length of the cable core is 120".